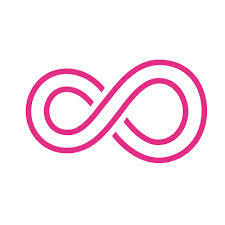 Infinity has always been controversial for mathematicians. Scientific American has a great article on the continuing debate. These questions and dilemmas have a special place in my heart. It was the first part of mathematics I’d seen that was as interesting as philosophy, my first love. It is a good read. I hope you enjoy. I saw this on a billboard walking through school. 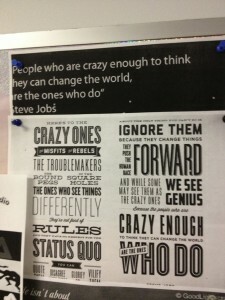 The Steve Jobs quote on top caught my eye, and not in a good way. I appreciate that the statement is trying to inspire people to change the world. For me, that’s a good thing. What bothers me is that I think these statements derive their rhetorical effect by making people mistake necessary and sufficient conditions. The naive thought is, ‘I can change the world if I’m crazy enough to try to change it.’ (i.e. ‘To change the world, it is sufficient simply to want to change the world.’) What Jobs of course is saying is not that you will, but that you’ll at least have a shot. In other words, if you want to have any chance at all at changing the world, it is necessary to endeavor to change it. The statement doesn’t sound near as inspiring that way however. I feel like Andy Rooney quibbling with this, but all things being equal, it is better to use rhetorical formulas that inspire when correctly understood instead of ones that only inspire if incorrectly understood.